This is the question writers are asked the most. And it is the one they enjoy answering the least. According to acclaimed author Neil Gaimen, getting asked this question is the primary pitfall of being a writer. So why do writers hate answering this question? Because the truth is, they don’t have a clue where their ideas come from. But a shrug of the shoulders and a “I don’t know” is the last thing the person doing the questioning wants to hear. So writers learn to make up answers. The controlled system is the part of our mind that we are consciously aware of and is within our control. People generally assume they are aware of everything that happens in their own mind, but in fact, they are really only aware of this controlled aspect. When you are trying to make a conscious decision (e.g., Should I eat the brownie or the apple?) it is your controlled system that weighs the pros and cons and ultimately decides which food item to eat. 1.Do the 24-mile round trip hike on foot. Take it from our personal experience—this choice is rough, especially since it is much easier hiking down the canyon than it is going back up! 2.Take a mule ride down. Although this second option is less strenuous because it requires less footwork on your part, it is not without its dangers. The mules walk the steep, hazardous trek on the outer edge of the trail, their hooves just inches away from the rocky cliffs. Often, just as the mule takes a step, its hoof will slide on a lose rock, threatening to dump the animal and its rider off the treacherously high perch. In those tense moments, riders often try to take control of the animal to steer it away from the edge, but despite their effort, the mule refuses to obey. People who select the second option often ask why the canyon relies on mules rather than horses. The reason is that a horse generally does what the rider wants to do, but a mule does what it wants to do. 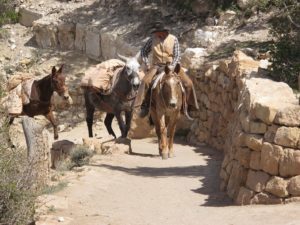 The stubborn nature of mules may sound like a negative trait, but miners in the 1800’s quickly learned that mules were better able to navigate the canyon’s treacherous trails because mules were more interested in preserving their own hide than listening to the sometimes poor instructions of their riders. In this analogy, the stubborn mule is the unconscious mind and the rider is the conscious mind. 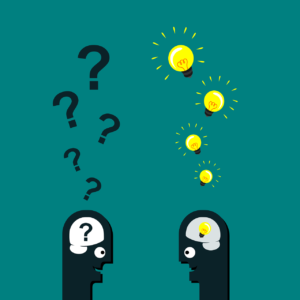 The fact that most writers are unable to articulate exactly where their ideas come from suggests their ideas come from their unconscious mind. Maybe it was a dream they had or a story they saw on the news or a book they were reading that fired up the engine. Whatever the cause, it sparked a creative idea in their inner mule and suddenly they were off to the races. For me personally, I do a lot of my writing in my mind so that by the time I sit down to my computer, the heavy lifting is already complete. Most of my “mind writing” occurs during those ten minutes at night while I am lying in bed trying to fall asleep or the ten minutes in the morning where I’m just starting to wake up. (Occasionally a story idea or snippet of dialogue rises up in the middle of the night as I’m rolling over or trudging to the bathroom—that is the worst!). As you can see, my “mind writing” tends to occur at times when my conscious brain is only half awake, allowing me to better hear the quiet voice of my unconscious mind. Recognizing that ideas don’t just get consciously invented out of thin air is inspiring. Because we all daydream or get bored and find our mind wandering throughout our day. The only difference is that writers have trained themselves to listen to their inner mule rather than ignore it. This recognition also offers a solution for the dreaded “writer’s block.” I find that when this pestilence strikes, it’s because I’m relying too hard on my conscious mind to twist the story into what I want it to say and my mule-like unconscious is refusing to go along. Which is why if you find yourself struck with writer’s block, it may be best to just hand the reigns off to your unconscious brain. Step away from the task at hand for a moment and try something else to get in touch with your unconscious mind. Go outside for some fresh air. Do a fun writer’s prompt. Start on a new project (preferably a short one, maybe a 500-word micro story) to get the creative juices flowing again. Then, when you’re ready to return to the target project, don’t force it. Relax the reigns and allow your inner mule to dictate where you should proceed. Chances are if you let it, your mule will take you in new and exciting directions. Of course, once your mule comes up with an idea, your inner rider—or should I say inner “writer” 🙂 —has to step up to get words on the page. My unconscious mind may whisper ideas to me but then it’s up to my conscious mind to translate these ideas and images and voices into coherent sentences and believable dialogue and vivid metaphors. Hopefully knowing that writers’ ideas often start from unconscious sources will help you tap into your creative side a bit. But what do you do when your mule is just refusing to budge? Are there things you can do to spur your creative mule into action? Yes, and that is exactly what my next blog post will address!